The 15-year gilt yields increased by 7 basis points during September 2.16% after being as high as 2.39% earlier in the month after German courts approved the bailout plan.. The European Central Bank (ECB) proposed a plan to buy unlimited amount of bonds from struggling member states as well as the European Stability Mechanism (ESM) and this was challenge by opponents claiming it was illegal. The German court ruling means that the ESM has been approved and can now be used to bailout struggling countries using a fund of 500 billion euros. 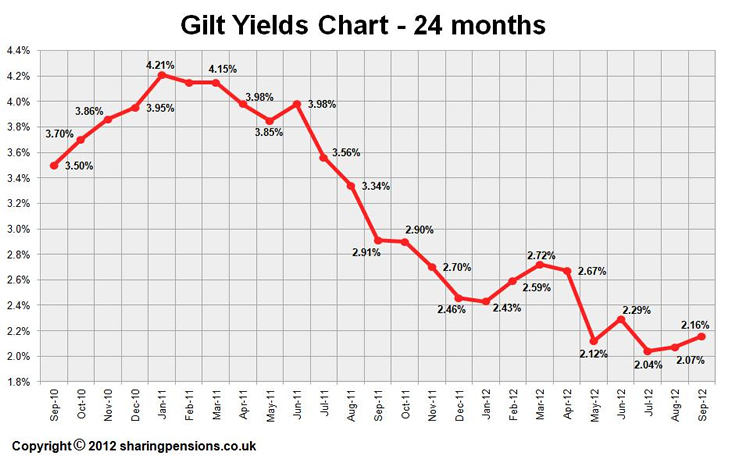 Despite the increase in gilt yields annuity rates have reduced with standard, smoker and impaired annuities lower by up to 2.3%. Overall standard annuity rates are lower by 0.89% and smoker rates by 1.31%. Although the data suggests that annuity rates can increase in October by between 1.74% to 2.21% the new EU Gender Directive is likely to force annuities lower during the rest of this year. For the latest updates see Annuity Rates Review.